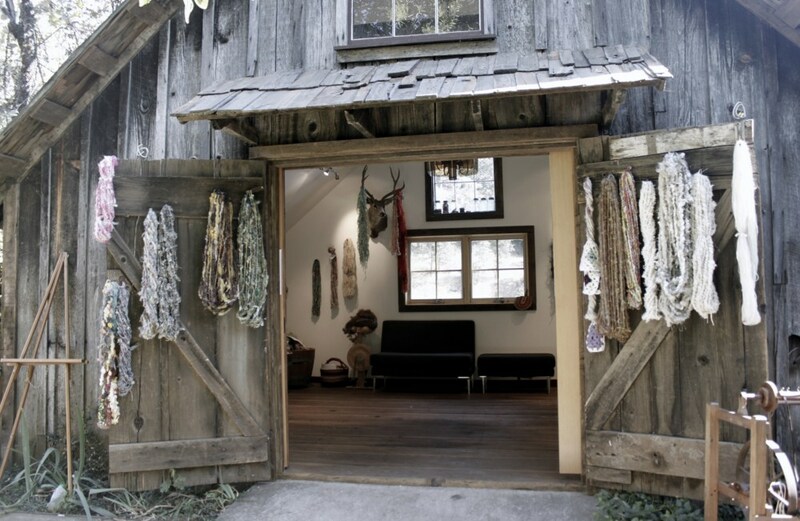 Nestled under fig trees in the Boeger Winery Orchard is a profound place of creativity and inspiration- the PluckyFluff Fiber Studio. 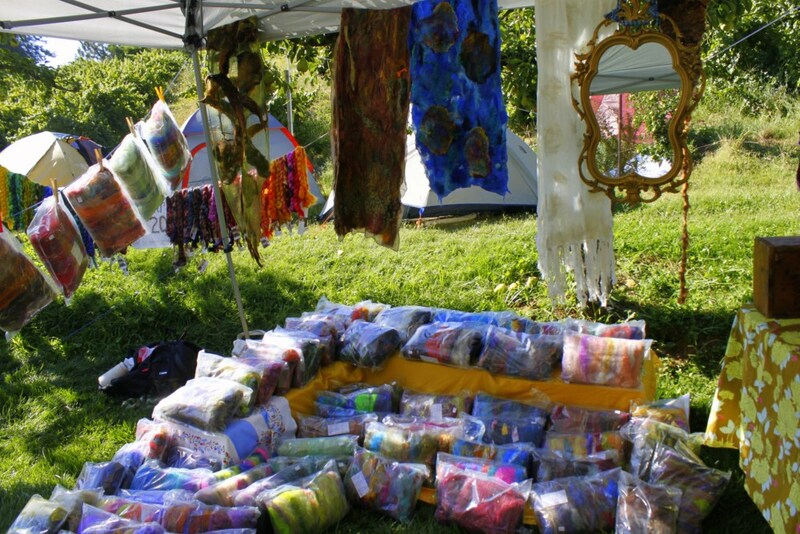 This past week was the grand opening, dubbed as the “Yarnival”.. and a yarnival it was! I was lucky enough to spend the entire week with Lexi and my camera. It was one of the best weeks of my fiber artist life. I arrived to the vineyard on Wed early afternoon. I was pretty tired after the excitement of Stitches Midwest, so I was really looking forward to some inspiration in the Boeger orchard. Byron and I rolled up and I was greeted by Lexi and her daughter Pixel fixing up my palace of a tent. I had an air mattress with a cushy down comforter, pillows, and a body pillow. 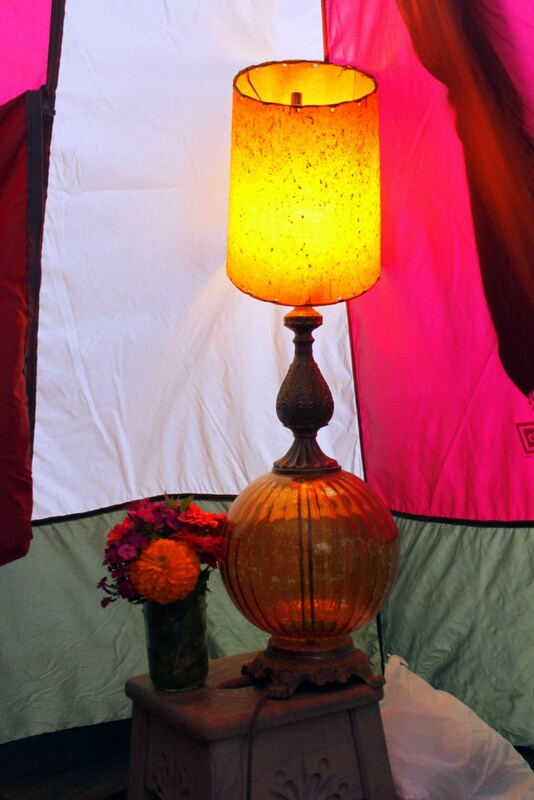 Lexi had run a power cord, so I had a beautiful lamp and a way to charge my phone. Pixel had even picked me fresh flowers! I felt so at peace among the pear and apple trees in the orchard. I quickly unpacked and jumped right into helping set up for the weekend’s festivities. When we finished our chores we decided to cool off from the afternoon heat at the Cosumnes River. This is Lexi’s go to spot for swimming, fishing and general fun, and I totally understand why! We made river trips three times during my visit. 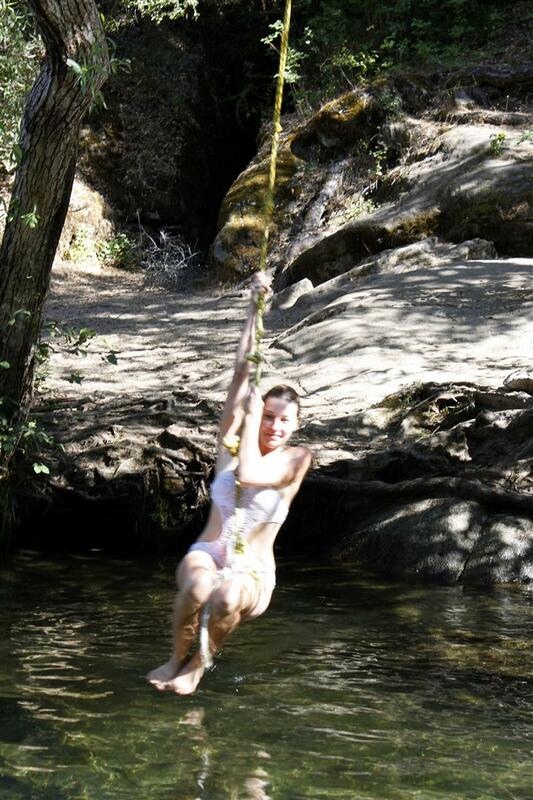 There’s something extra special being able to just take a drive up the mountain a few minutes to a wonderful spot with a rope swing, rocks to jump off, spots to sun and spots to lay and cool off. It’s a beautiful spot. I’m not sure I would get much done with such a spot only a skip away. We got to do some swimming with the kids (Lexi has 2 amazing kids), and a couple of friends that had already arrived for the festival. Clear cool water and warm sun – it was truly magical, which quickly became a trend for the entire time I was in the vineyard – magic. By the time we got back to the vineyard other friends had arrived. The extra special thing about events like this is the power to bring people together from across the country. I got to hang out with my friends Heather (Girl with a Hook), Ashley (Neauveau Fiber), Brittany (BohoKnitterChic) and Carrie (CraftyPuppyLover)- between us we are at the 4 corners of the country and lucky to see each other once a year., so an entire week with them was so exciting! Not only that, but I made lots of NEW friends that just made everything much more awesome. When we got back from the river Heather, Brittany and Heather had arrived. We started up the grill with Lexi and put together an amazing meal of steak, lamb sausage (that Heather brought from Oregon and I MUST get some more asap it was SO GOOD!) grilled veggies and grilled corn. Oh and wine. 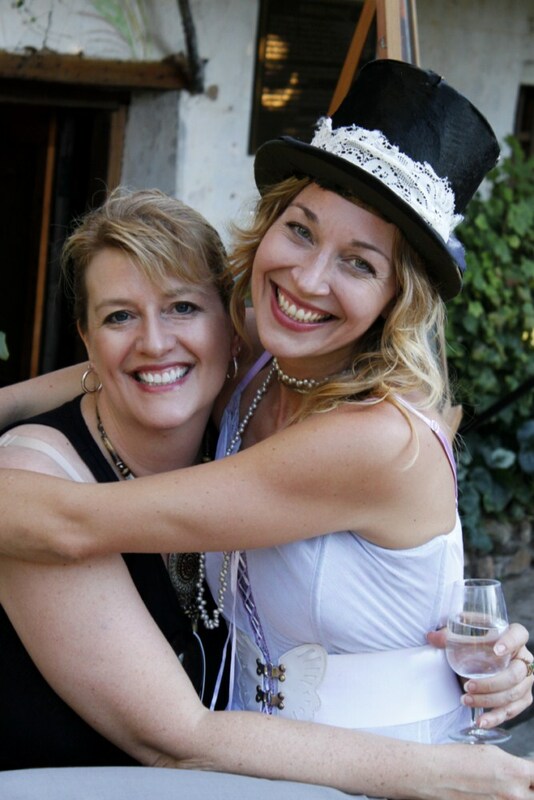 Did I mention this entire event was being hosted at a winery? Right…just making sure. 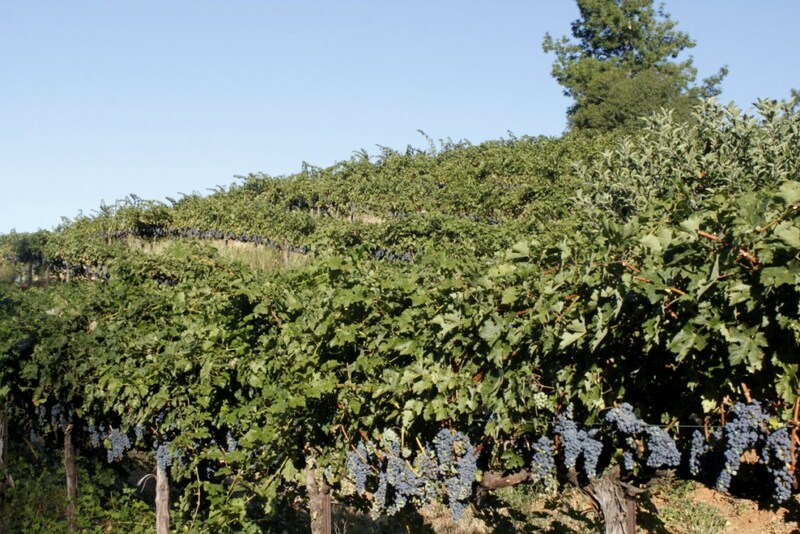 Lexi’s parents own Boeger Winery, an award wining vineyard in the Sierra Foothills. Lexi lives in the original homesteaders house, above the old cellar. 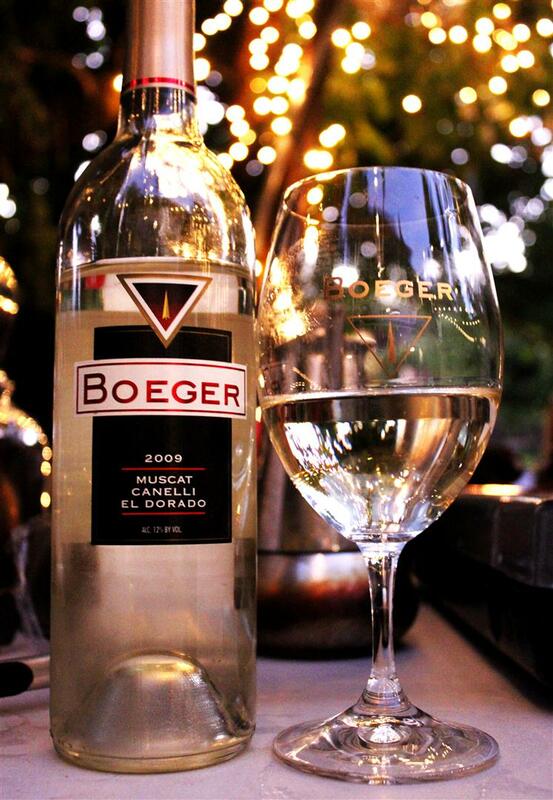 Back in the days, they made wine in the living room of the house! There are even still vines that grow from the 1800’s! Gold was discovered only 15 min away, so there’s some amazing history to the area. 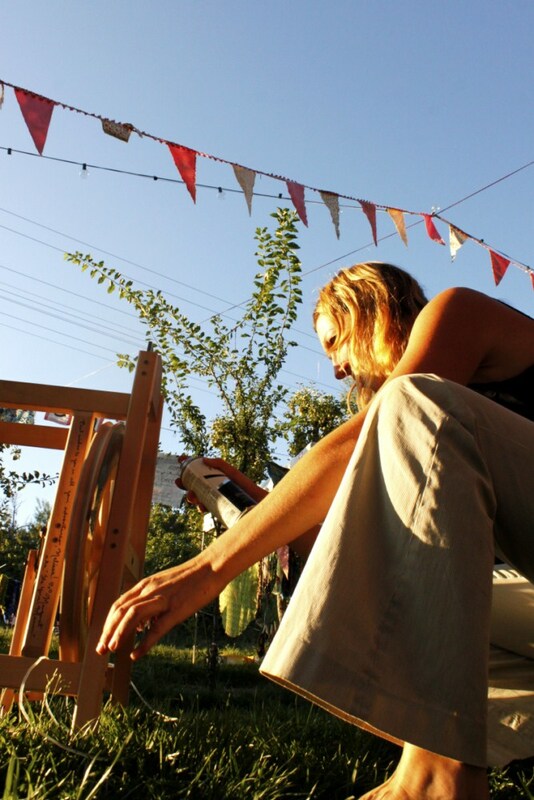 Lexi has a beautiful balcony porch with a spinning wheel. A perfect place to rest her boots after a long day! All week I was treated to the most amazing wines. It was not tough living at all, let me tell you! The wine is extremely fantastic with lamb sausage, while spinning, mixed into their “Hangtown Cooler.” However you drink it, I did not have any that I didn’t enjoy. After an amazing dinner and a wonderful sunset we went and played in the studio before hitting the hay. 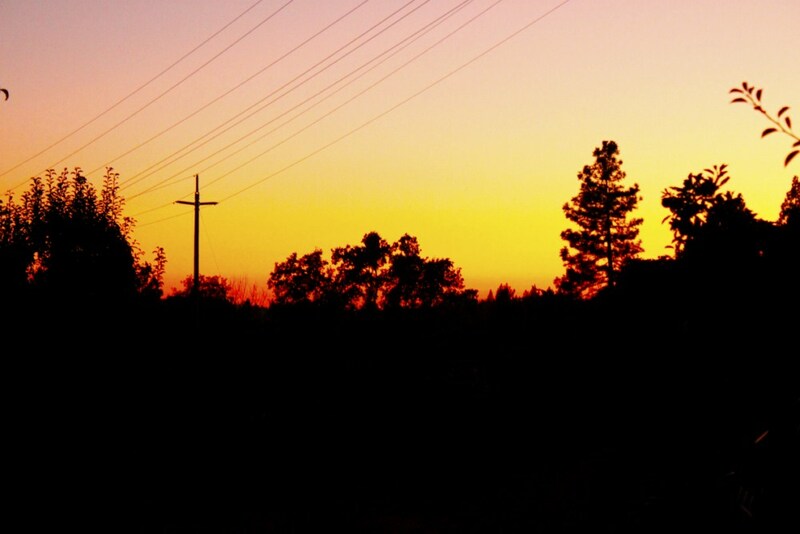 Hangtown sunsets are really something special. I was treated to sheer beauty each night! 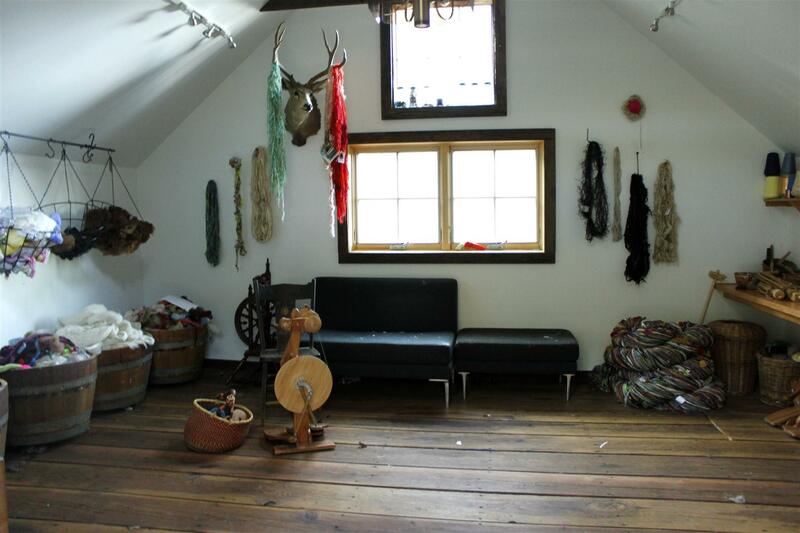 The PluckyFluff Studio is a really spectacular place of creative inspiration! 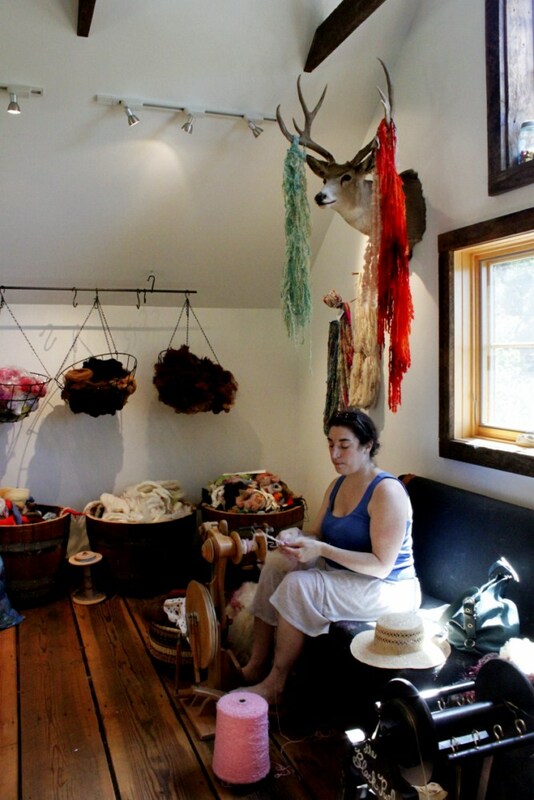 There are baskets of fiber hanging from the ceiling in beautiful iron baskets made by the blacksmith onsite. There are wine casks full of fiber, ready for people to dive in, complete with the sweet smell of wine. There is a table of carders, with a shelf of every color and texture plying/wrapping yarn you can imagine. There are wheels – studio wheels for people to use when they come to the studio! Heather used my Lendrum, which I had traveled with, but I was able to use one of the studio Aura’s all weekend, which made me really happy because I was super missing my Aura which was at home. I really loved the vintage mason jars that lined the upper window. 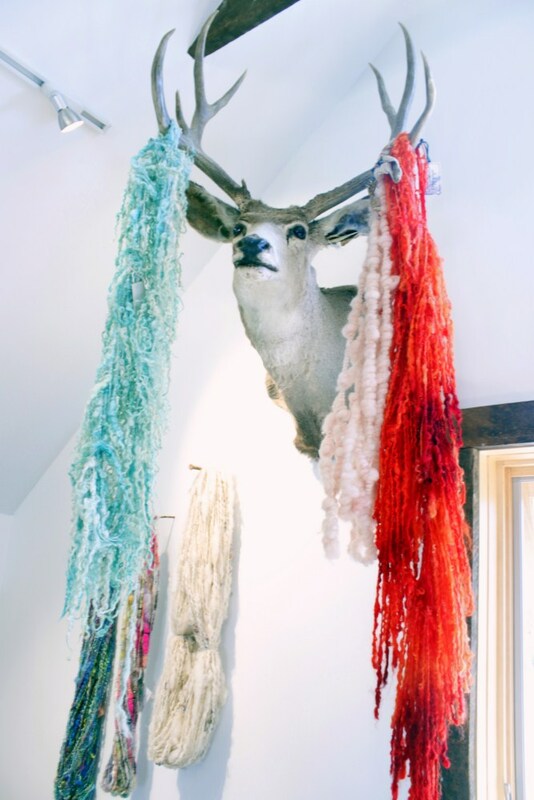 For me, the most special part of the studio was my Seaglass Extreme Tailspun yarn hanging on Lexi’s deer head. 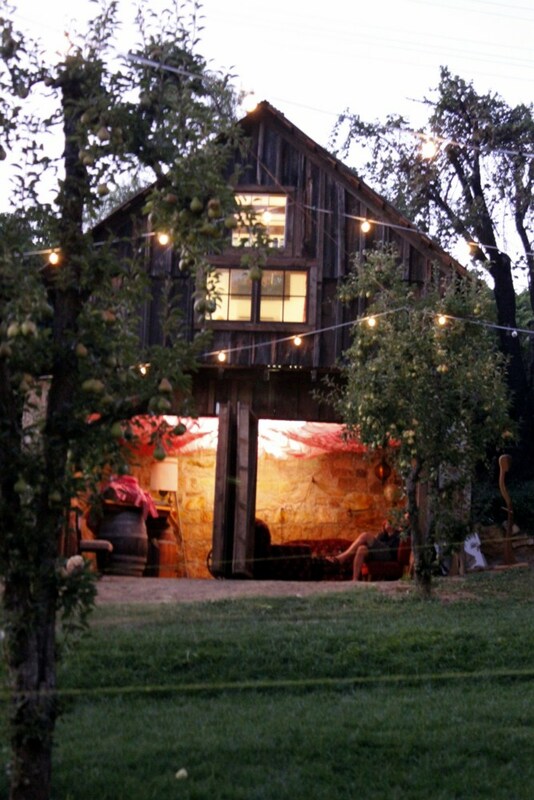 After finally giving into exhaustion, I went to sleep in my comfy bed among the pear trees. When I woke up it was a cool and beautiful morning. Lexi made her amazing yogurt pancake batter, to which we added fresh blueberries, dried cranberries, almonds and a few chocolate chips. With that and coffee, best breakfast ever! 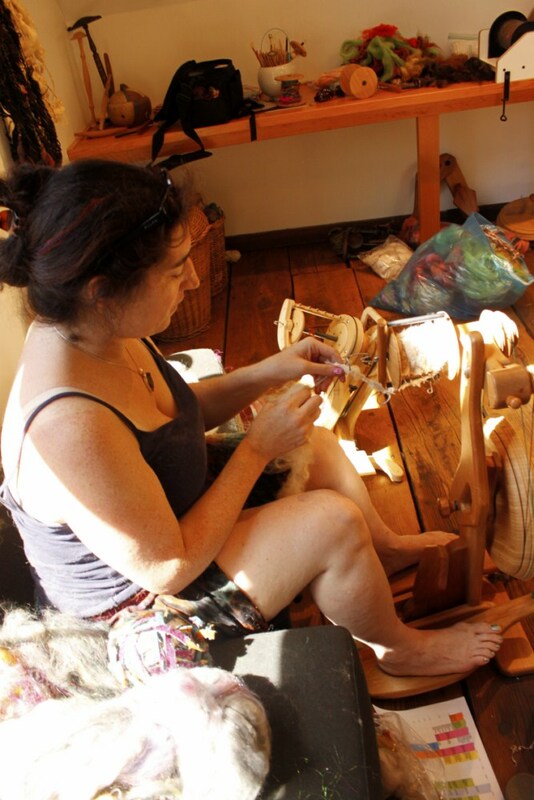 After breakfast we spent time playing in the studio- carding and spinning. We set up our booths for the Yarnival. Heather and I shared a booth for the weekend. We were JazzTurtle with a Hook!! After we were set up we went on a thrift store run to find our Yarnival outfits (and cowboy boots) I found a pair of awesome boots for $12 and a pack of granny squares for a buck! After we got back we decided to go for another trip to the river! See what I said about easy to run off and take a dip? This was one of my favorite parts of the trip! This time we went with a larger group of friends, as well as the kids. It seemed hotter outside so the water was even cooler than the day before. It was just wonderful. 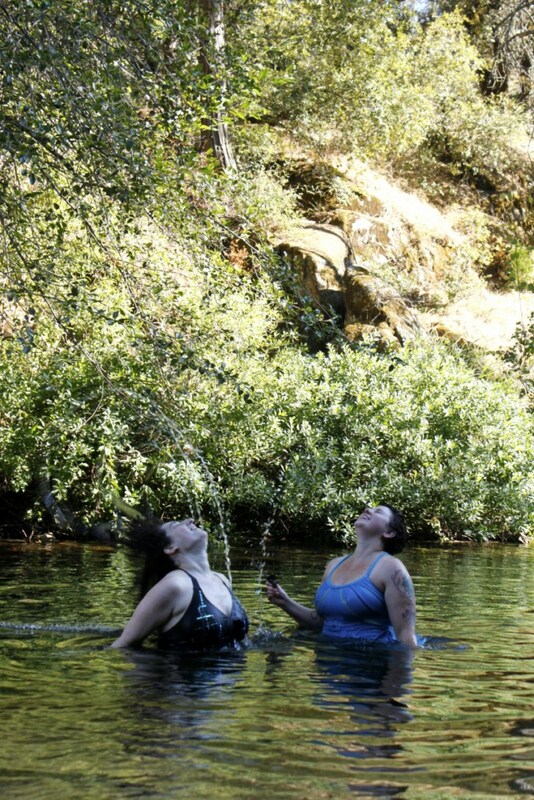 Heather and I channeled our inner mermaids. I love this river! Have I mentioned that I’m not sure I would get any work done. I did? Right. When we got back from the river the studio was glowing. 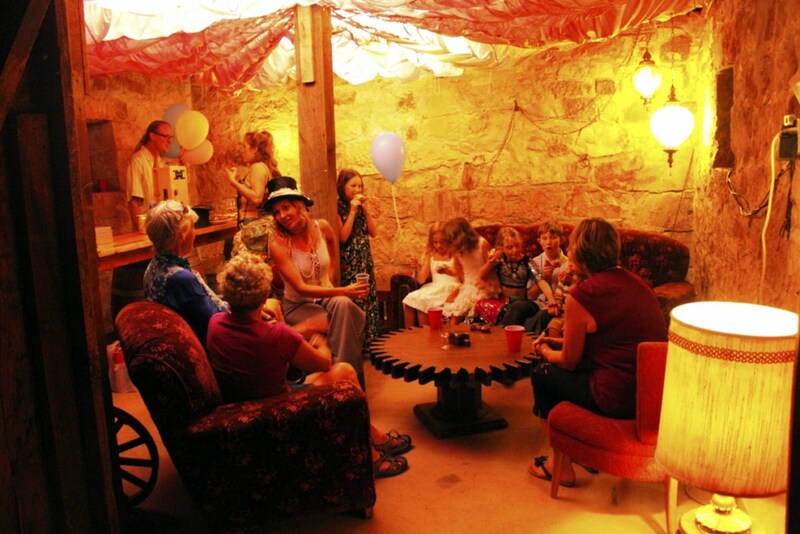 Both the top studio area, and the bottom “Saloon” hang out area were filled with beautiful light! More friends had arrived and were feeling the creative energy. We grilled another amazing meal, this time lamb sausage, salmon, grilled veggies and a yummy caprese salad from the garden. We enjoyed another beautiful sunset along with more fantastic wine and then we spent some more time playing in the studio. There is something really special about the studio at night. 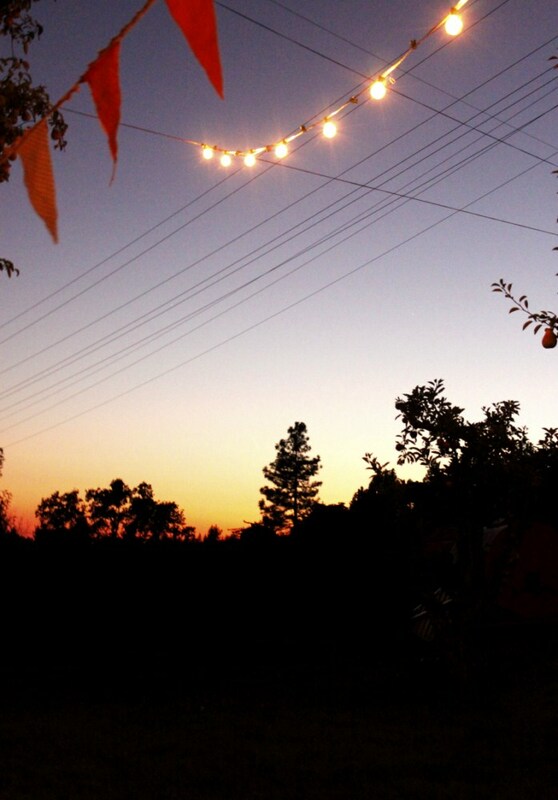 The crickets sing, the lights glow and sometimes Gravy the cat comes for a visit and hops around in the fig trees. I got my best spinning done by myself, after midnight. When I finally gave into sleep that night, I’d already spun 6 yarns and had carded a few batts for the weekend’s activities. My dreams were of the next day’s Yarnival fun. When I woke up in the morning the day was full of anticipation. The sun was glinting off of the grapes. Another yummy breakfast and then I went for my last quiet studio time before madness descended. Everyone was gearing up for the evening’s festivities. 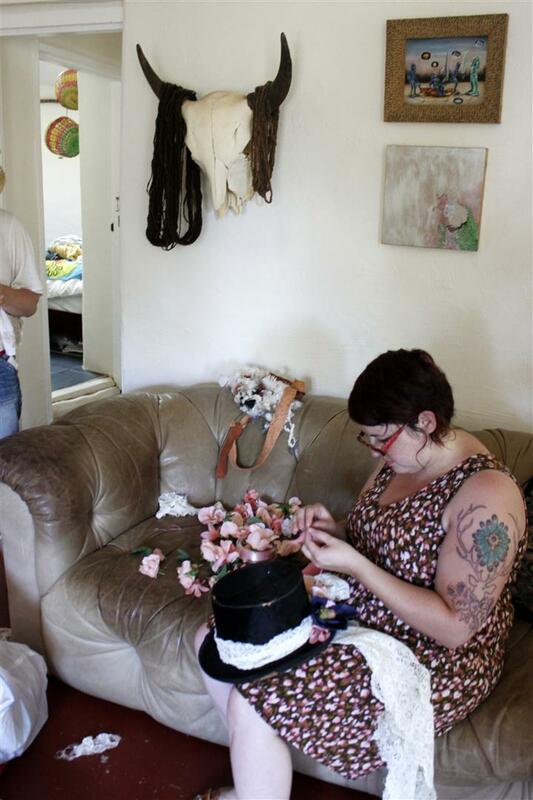 We donned our Yarnival costumes and helped Lexi finish her Ring Leader top hat. It was a JazzNeauveau with a Hook creation! Heather had a wonderful carnival dress, Ashley had the perfect lace she made into the ultimate neauveau skirt and Jenny, oh Jenny. Jenny had a custom made carnival dress. Red and blue with sparkles and stripes. It was just fantastic! 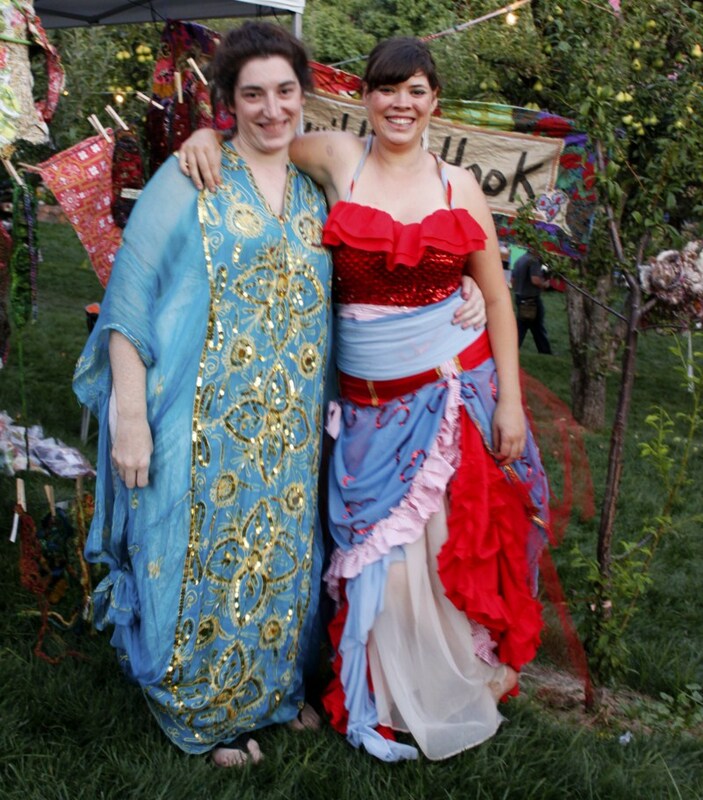 Lexi had her butterfly belt and top hat and I had a turquoise chiffon caftan thingy, with gold sequins. I wore a double layer of lace underneath. It was pretty ridiculous, but totally Yarnival! 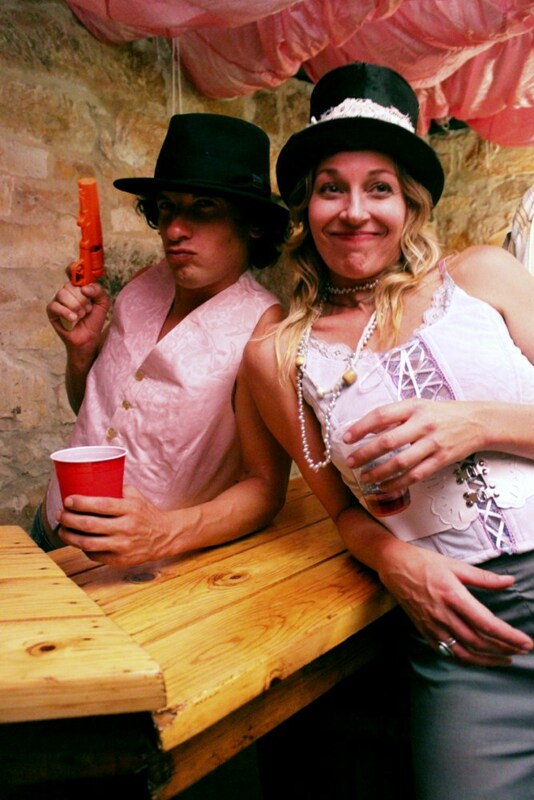 We helped the kids get into their costumes and the party began. 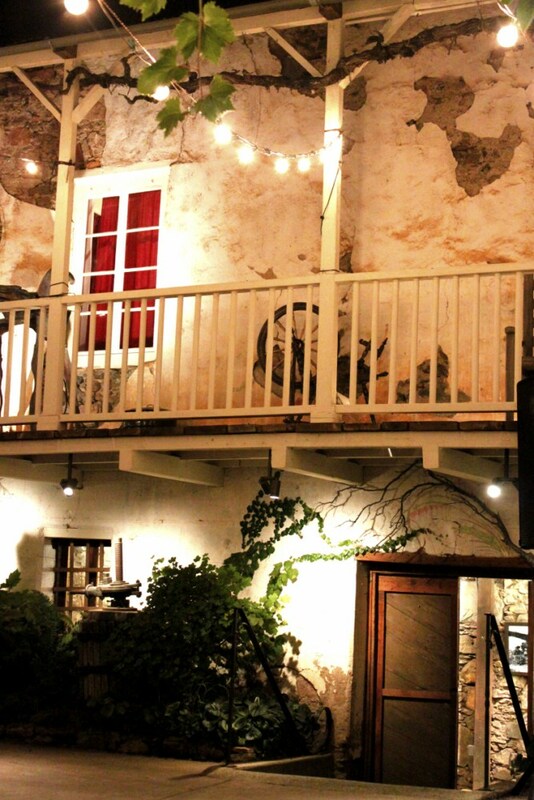 First the evening started with a VIP reception in the old cellar for the folks that donated to the Kickstarter project. When Lexi had first conceived the project of renovating the old turn of the century barn into her studio, the cost was quite significant, at $19,000! Lexi’s parents told her if she could raise $10,000 then the winery would match the funds, as it will be a stop on the winery tour. Lexi started a Kickstarter project that offered ‘rewards’ for different levels of donations – ranging from a Thank you card for $5, an autographed copy of her new book for $25, a skein of her yarn for $100, a personal winery tour and catered meal for $350 and her coming to personally create an art installation in any space for $1000.00- with lots of other rewards inbetween those donations! Not only did Lexi hit her $10,000 mark, but she exceeded it! It was a wonderful show of community support for this project! As a thank you, Lexi hosted this small VIP reception. She brought out 3 bottles of vintage “library” wines from the vineyard. These wines were definitely the best I have ever had. 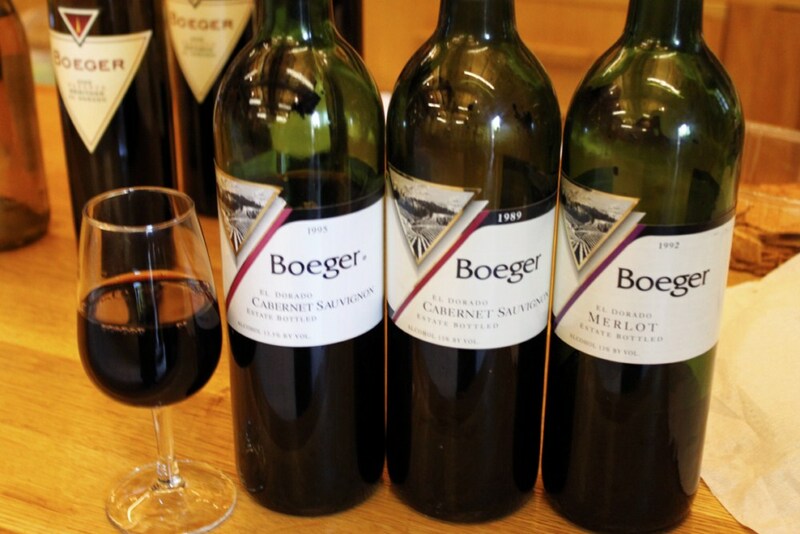 My favorite was the 1989 Cabernet. It was just amazing! After the VIP reception, the party kicked into full swing. 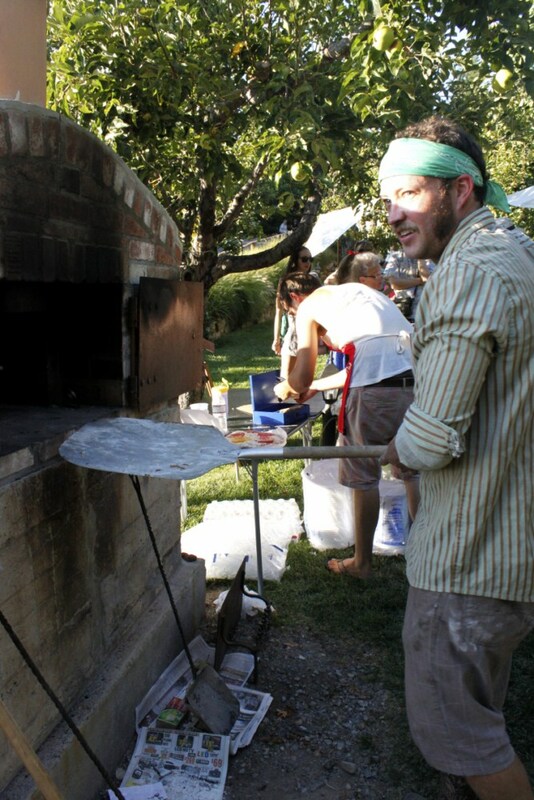 Byron and Alex were making Artisan pizzas in the brick woodfire oven. Lexi had booked a couple bands that were playing great music. 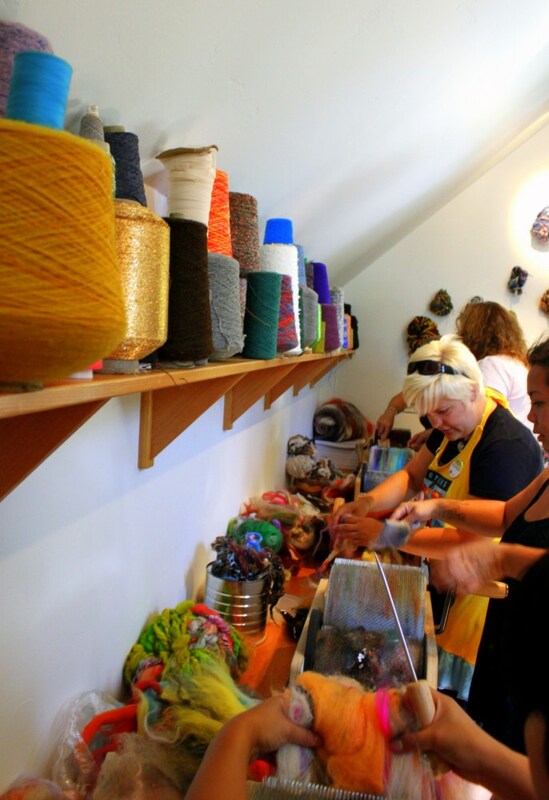 People were everywhere – up in the studio checking out the new space, walking around the Yarnvial in the orchard, shopping at the booths, and walking around the Giant Skein, which was wrapped around huge tanks ready for more yarn to be joined. Did I mention the pizza? It was perfect with the wine. Byron and Alex were making Margarita, BBQ Chicken, Mediterranean Chicken and Pepperoni pizzas. They were AMAZING! Byron and Alex had worked late into the early morning hours for 2 nights putting together the pizzas and freezing them for the event. They used all fresh veggies and produce. You could taste all their hard work. Everyone I spoke to was raving about what they were eating! 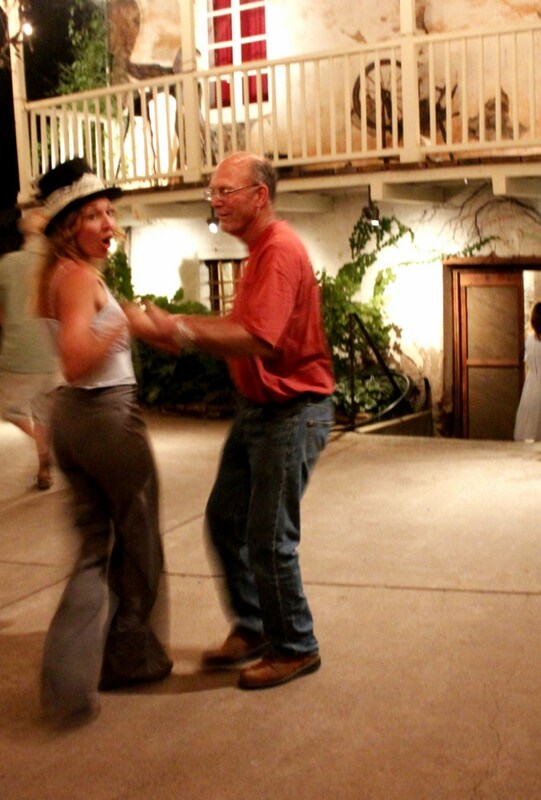 And dancing – lots of dancing! It was wonderful to see everyone having such a great time. The band, Marigold, was great! A wonderful mix of folk, country and rock. Perfect for dancing, hooping and the general mayhem that was going on. Lexi and her dad can REALLY dance!! There was LOTS of activity in the orchard! People were walking around and buying stuff from the booths, there was a fortune teller, bobbing for apples and fiber animals for petting! 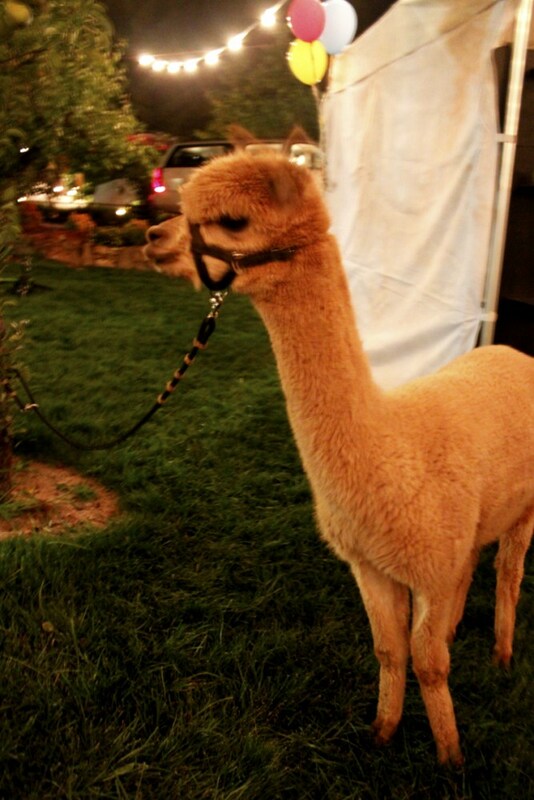 There were alpacas, sheep and goats- even babies! The kids spun yarn and used it for balloon strings. 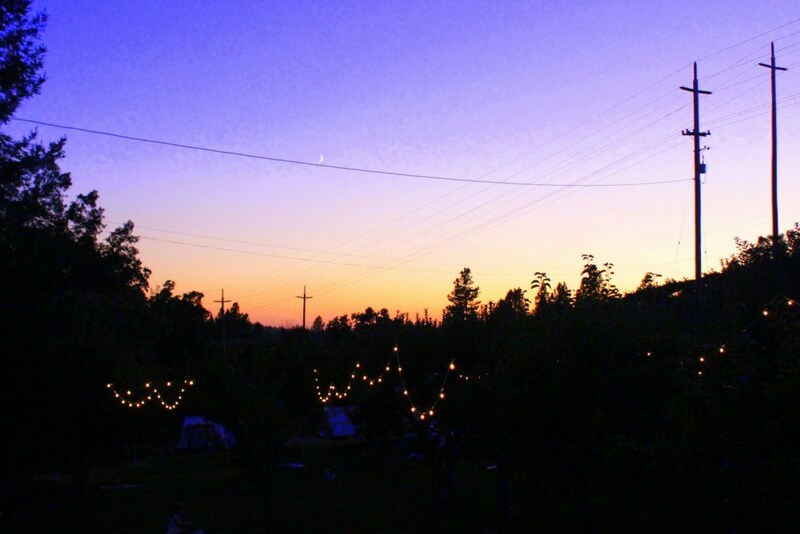 There were twinkling lights hanging, another pink parachute draped in the middle of the orchard like a big top – remember me talking about the magic of the weekend – here’s where a lot of the magic happened. Friendships were formed, and inspiration was shared. Walking around all the booths was so incredible! 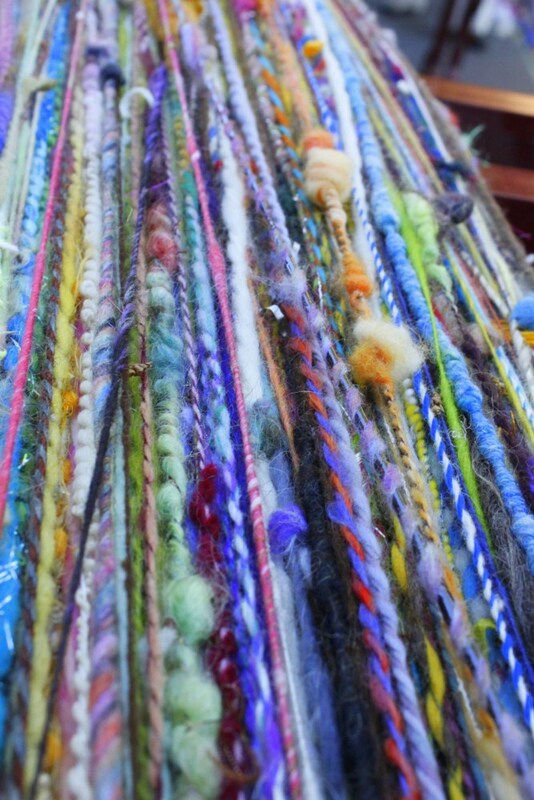 Everyone has such amazing ideas for what to do with their yarns! Things I’d never even thought of! Wait until I show off all the cool things I scored while I was there! Not only were people upstairs checking out the new studio space, people were downstairs in the “Saloon” hanging out and drinking “Hangtown Coolers.” The saloon has had one of the hugest transformations, as only 3 months ago it’s where Greg stored his Model A cars. He graciously gave his space over for Lexi’s creative spot and a place to hang out and have a cool drink downstairs! Lexi really did the Saloon up with beautiful glass Turkish lamps, a vintage purple velvet couch and chair and a cool spinny table. Lexi had draped a pink parachute on the ceiling so it felt like we were in a old time carnival tent! To top it off was the bar in the corner selling “Hangtown Coolers,” which is a spritzy house wine cooler and a Hard Cider made by a Boeger family friend. 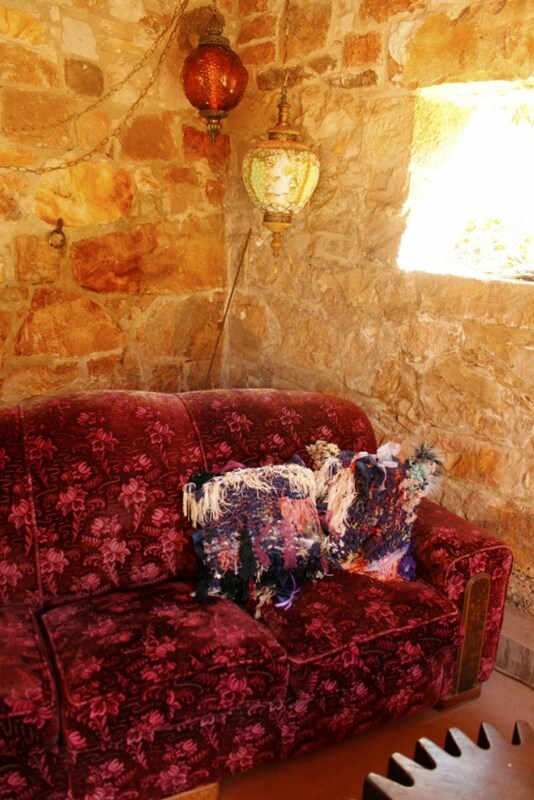 Deb Lambert (Owner of Picasso Moon yarn shop in Sarasota FLA) donated her incredible Paris Apartment pillows to Lexi to keep in the saloon because they matched the decor so well. I wish I could’ve afforded one to take home, but they look so perfect in the Saloon, I’m glad that’s where they live. The party really raged well past the “posted” end time. The band was still playing and pizzas were still being made past 10:30! 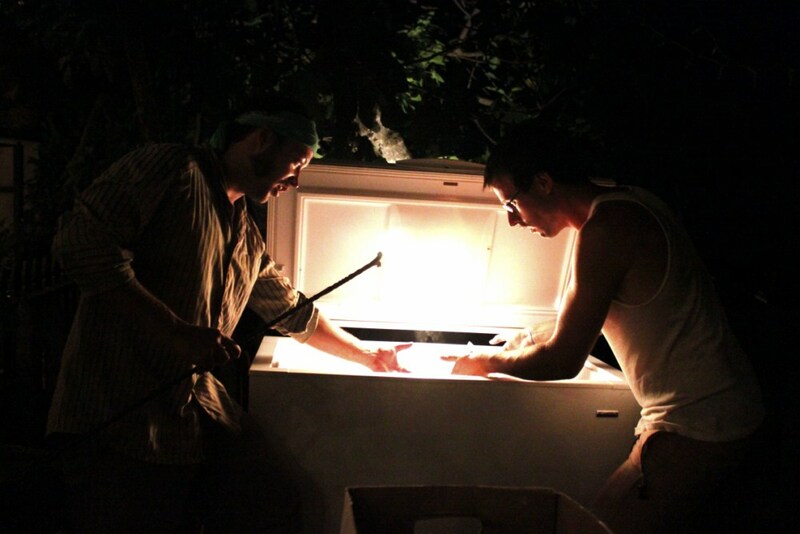 Byron and Alex slaved over those pizzas. They really deserve LOTS of props for standing in front of that blazing oven all night! By the end of the night, the pizza cooler they had filled was finally showing signs of the huge hungry crowd, but they kept keeping on! At some point the party began to wind down and those of us still going moved to the Saloon. This is when things got really over the top. Hangown coolers flowing-I admit that I had more than my share! 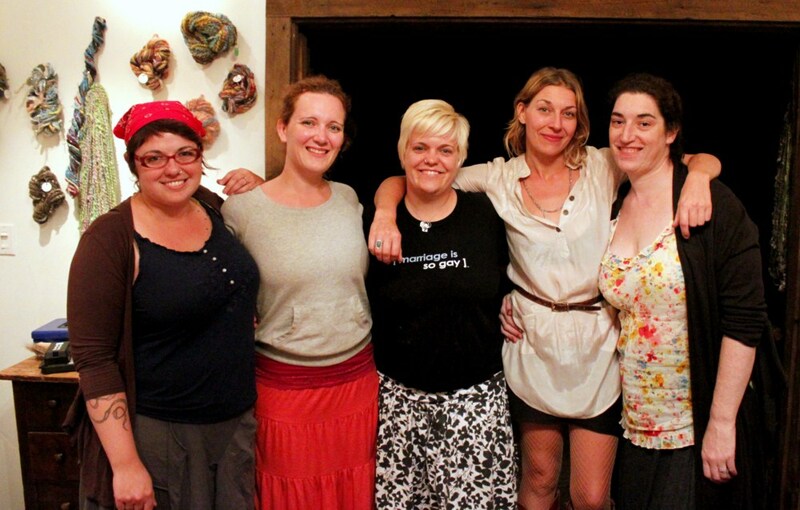 It was wonderful conversation, more dancing and lots and LOTS of laughter! It really was a perfect celebration of all the hard work that was put into this event and making the studio a reality! A celebration well deserved!! The party broke up around 2am, and we all stumbled back to our beds still laughing, not thinking about the workshoppers that would be arriving in just a few hours. Not long after we fell asleep it was time to get up! A beautiful day awaited the orchard, and after some bacon and coffee, we were ready to tackle everything! Workshop attendees started arriving around 9am and Natalie, from Namaste Farms, was one of the first. Natalie brought her 2 bottle lambs, Simon (babydoll southdown) and Roberta (wensleydale). These babies were SO cute! Natalie said that Simon rode in the front seat of the truck on the way up! The studio space filled quickly. This was one of the fullest workshops I have seen, with spinners of all modalities. People were in the studio and outside on the grass, and then people were spinning in the orchard under the parachute as well! I had carved a little spot by the door in the studio for myself so I could be on hand to help anyone that needed. Lexi jumped right into the techniques with carding crazy batts and spinning them into textured singles. It is so fun to see people try to break out of color ruts and get spontaneous digging through fiber bins without looking! It was a beautiful day and during lunch Lexi had a chance to walk around the orchard. She found one of Heather’s (Girl with a Hook) freeform crochet hats that was just perfect on her, though she said it was going to Pixel…but I’m not sure she’s going to wind up sharing it in the end! After lunch we went back up to the workshop where people were just soaking in the creative energy and general fun all around! People were sharing stories, fiber and techniques! It was a real community! No one minded that the studio was PACKED! After the day’s workshop was complete we had to take a run to the river! 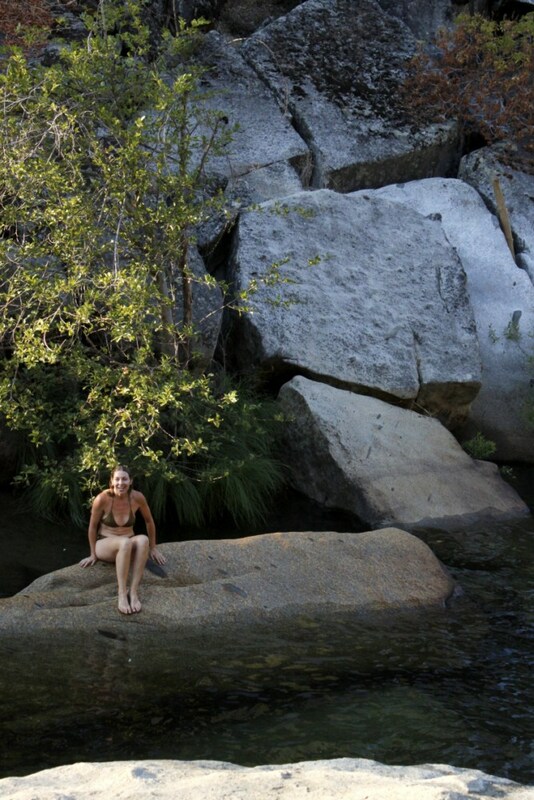 This time we didn’t have the kids with us, so we were able to go to a spot with great rocks to jump off into the river (rather than the lightly sloping lagoon). 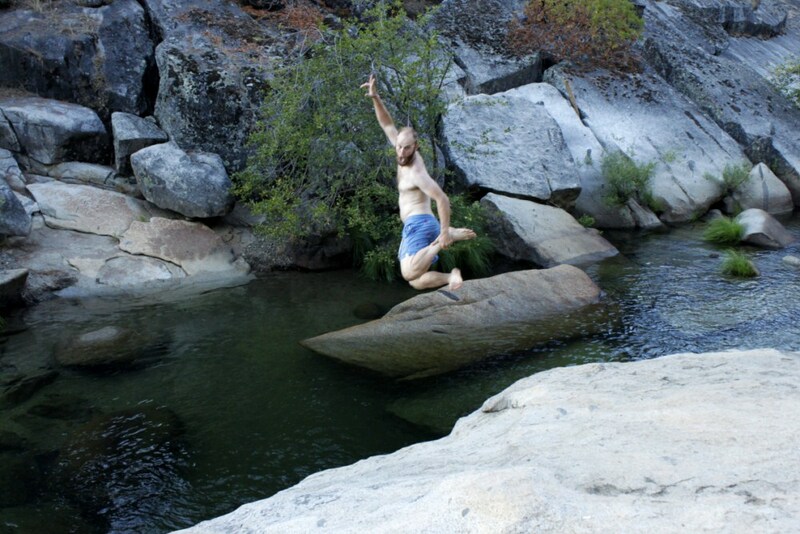 It was a blast and Brian Wilson mastered the rock jump quite quickly! It was the perfect way to end the afternoon after a morning that was a bit more difficult than I’d had in many years. This river spot was deep and cool, not as well visited as the more family spot we visited earlier. It was great to get to see a couple of Lexi’s “spots.” There was fool’s gold glinting under the water, teasing would be prospectors. After our river swim we headed back to the winery. 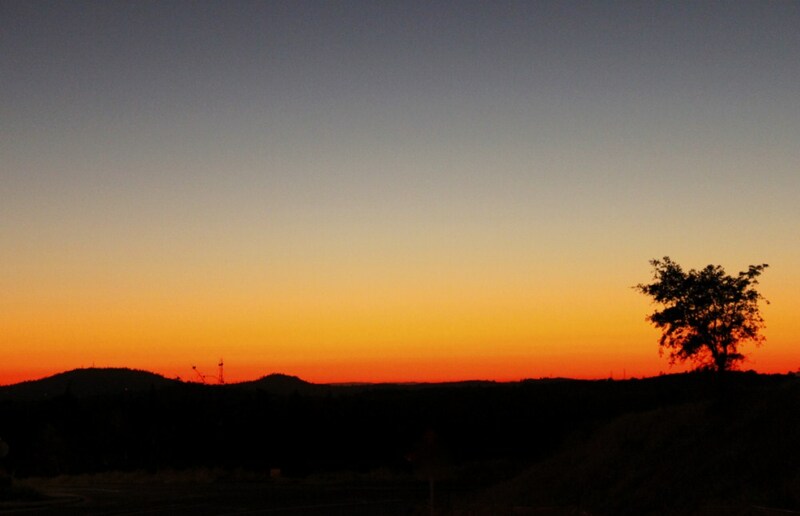 We caught an amazing sunset (of course) while we were gathering for dinner. Heather, Arlene and I went to dinner in town and then came back for some creative studio time. When we got to the studio we found Carrie, Brittany and crew already in there having a grand ‘ol time! This is the greatest thing about an event like this, the free spinning time together! We NEVER get to spin together, playing on each other’s wheels, bouncing techniques and ideas off one another. It’s better than any organized workshop! Lexi joined us after she got back and we pow wow’d for the next day’s activities. We also got a ‘family’ photo (minus Ashley as she’d already gone home for the evening) We hung out for awhile and continued to spin before calling it a night once again. The next morning I missed breakfast due to the beautiful cool morning just making it too difficult to get out of bed, so I went straight up to the studio to help get the morning ready. 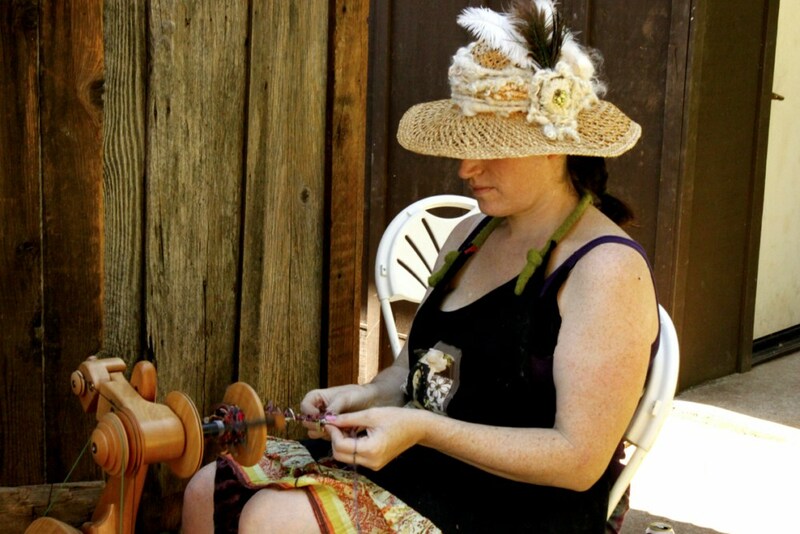 Lexi started the day with tailspinning, so I moved outside to help, and then I stayed for a bit of creative spinning. You may notice my “Neaveau” hat, which is inspired by Ashley and her beautiful hair clip with the feathers. Nat gave me a handful of her beautiful pygora, and another of some curly wensleydale, so I mixed that with some white alpaca, copper thread and ivory slubby yarn for my Ashley inspired hatband. After the morning part of the workshop, Natalie sheared Roberta (the wensleydale lamb). It was her first shearing, so she got a bit scared. Nat did a wonderful job of keeping her as calm as possible while shearing the fleece with great care not to make second cuts in the fleece or to cut the lamb. Roberta was SO happy to be rid of her heavy coat. She got a kiss from Nat for being such a good girl!! 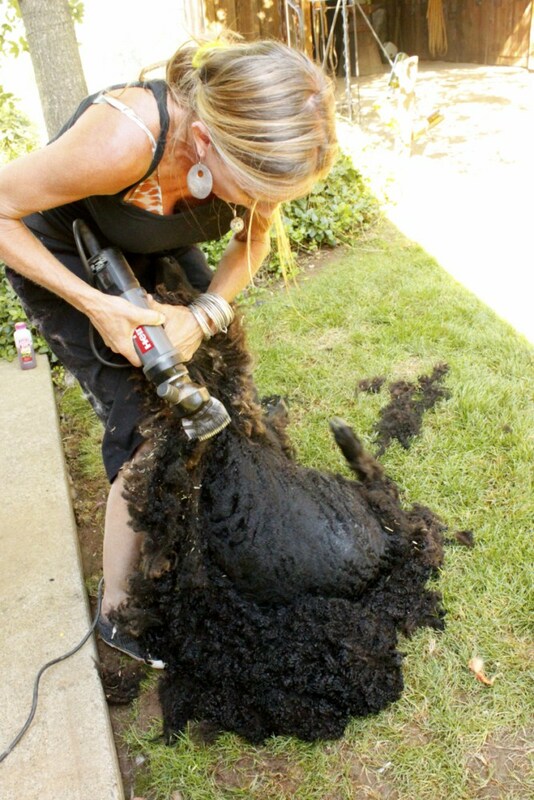 Her fleece is a beautiful black with tight curls. Lexi was the lucky recipient, and if I know her, she’ll be spinning it raw. I can’t wait to see that yarn! As the day began to come to a close, a sheperd arrived with a truck full of fleeces for $10 a bag. It was like lions to a kill as people rushed the bags. I scored a couple beautiful Jacobs fleeces that I’m excited to wash. Lexi got a textured ram fleece. I saw curls and crimp, and they were gone in minutes!! After all the fleeces were bought, Lexi asked all the spinners still at the event to donate a yarn to the Giant Skein. 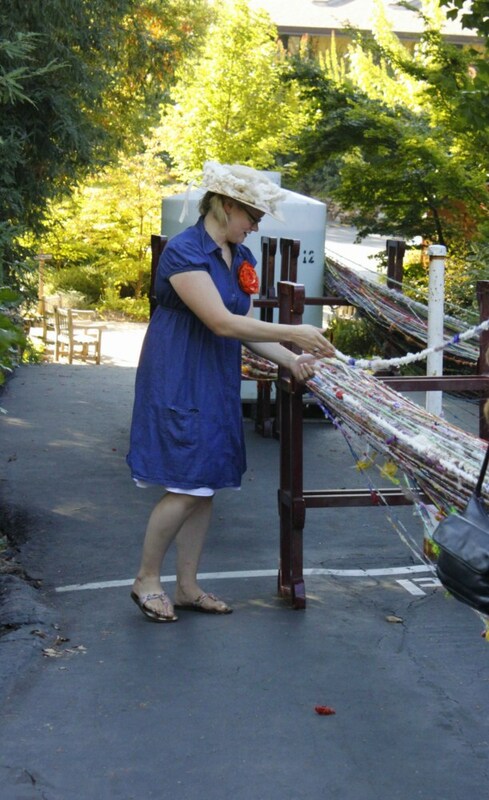 We all walked together over from the studio, and had a “closing ceremonies” of sorts as we all cheered each other’s yarn and joined our yarns to the Giant Skein. 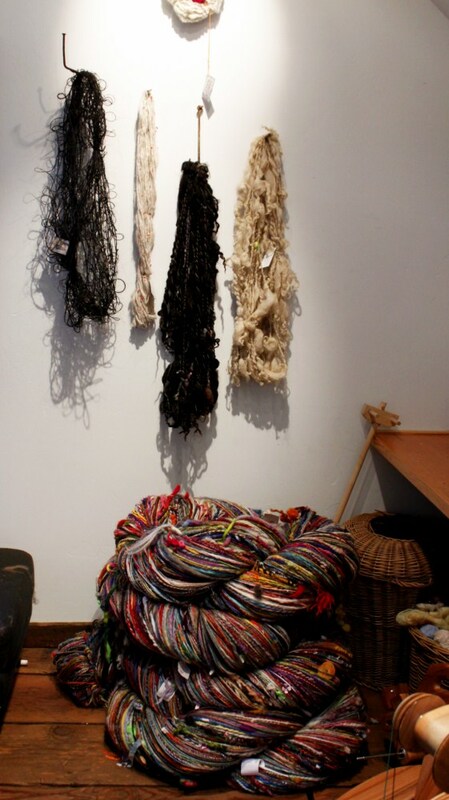 The Giant Skein is a project that Lexi started last year as an art instillation for her show in Norway. She called for spinners all over the world to send her yarns which she would join together to make the worlds largest skein of yarn. As it stood, it was 80lbs and 10.5 miles. More yarns were added during the weekend, so it’s larger now. 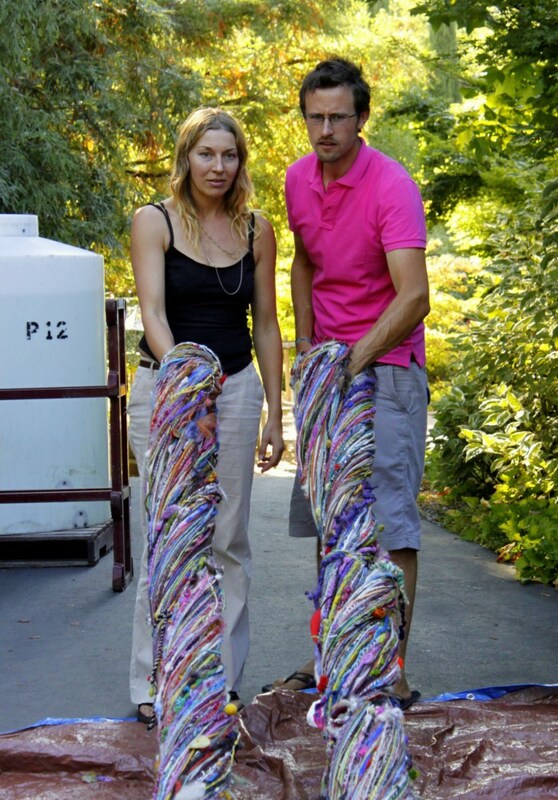 The yarn has been submitted to Guinness Book of World Records to be the world’s largest skein of handspun yarn. 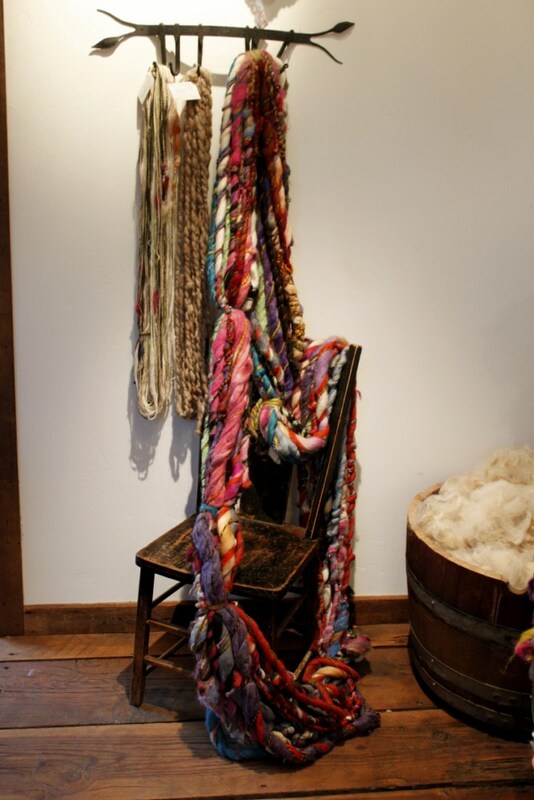 Once we were done joining our yarns, we twisted it into a skein. Then we all carried it down to the studio. It’s going to be happy there, and possibly start a relationship with the cement mixer skein. It (the Giant Skein) did give an interview to Arlene for Spin Artiste, but there will be a bit more about that in a later post. I hope more people can join their yarns. It really is an incredible project highlighting the community aspect of our craft. 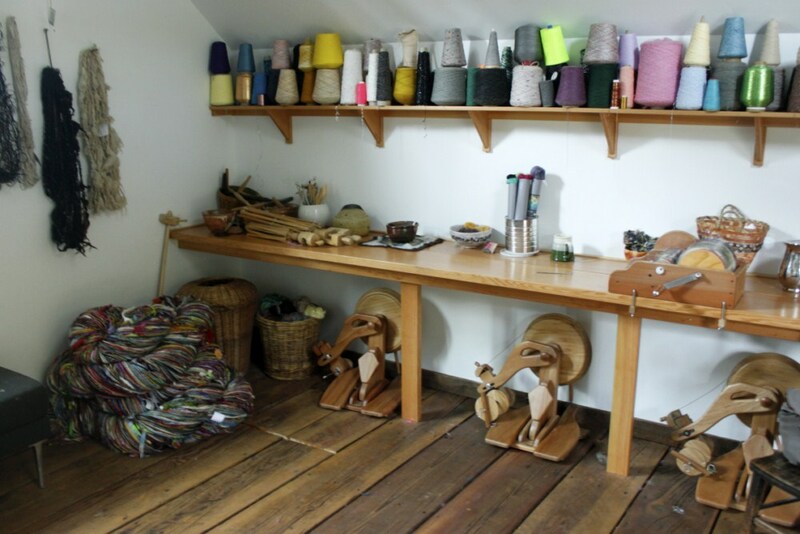 After the skein was settled in, people began to pack up their supplies and leave. The Yarnival was coming to a close. WE however, still had some celebrating to do. Lexi grabbed some spray paint and markers to decorate Melissa, Heather and Ashley’s wheels, some wine and cooler to make Hangtown coolers and we all met under the big top one more time. 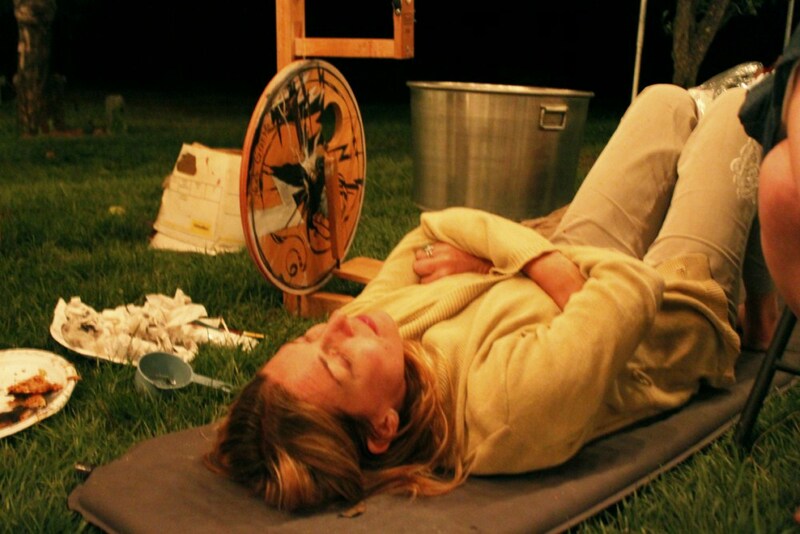 We listened to the recording Arlene made when she interviewed the Giant Skein. Apparently it is a he, and he’s very fond of himself. He thinks he’s pretty awesome. His interview will be up on Spin Artiste soon, and I will link back to it in a follow up post. It’s not to be missed! After yet another amazing sunset- SURPRISE- we had to start saying goodbye to some of our new friends. We hung out under that parachute until it was time for bed and we were the only ones left (we being Lexi, Jenny, Byron, Alex, Heather, Ashley and myself). Lexi painted wheels, we laughed and just relaxed. The pressure lifted after such a successful weekend! Everyone had a wonderful time. There were no major crises. All in all a wonderful week! Then the real exhaustion kicked in. There was no late night studio time that night. We went up and played for awhile and then went right to bed! I think that was the first night I was actually asleep before midnight. The next day was all about clean up! Leave no footprint, take only memories! Luckily the pink parachute in the orchard didn’t come down while I was there. I think that would’ve been too sad! Ashley joined Jenny, Lexi, Heather and I at the vineyard for one more day. It was just the five of us left standing (seven if you count Byron and Alex- which we usually did). After we went into town for an amazing breakfast that included local Olallieberries (I had the best blintz of my Jewish life) we cleaned up the studio and did a bit of final spinning. I carded batts from all the scraps/ wool I swept off the floor and cleaned off the carding table. Those yarns are destined for a weaving project. 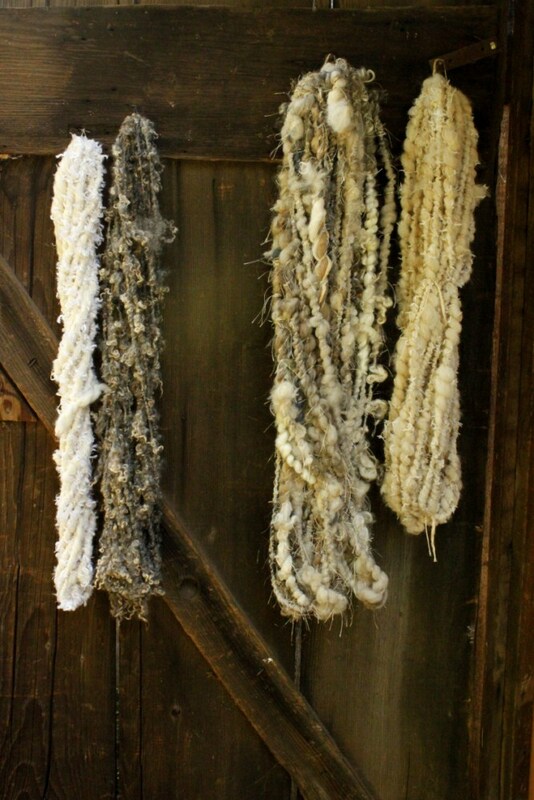 Now that the weekend was over, all of our spun yarns hung on the old barn doors. Talk about perfect Kodak yarn shots! I can’t wait to make postcards from the photos I took of what I spun over the weekend. In total I spun more than 10 yarns, including a yarn with some of the thrift store granny squares, a a cloudspun over a felted sweater and a funky “ugly couch” yarn with some crazy novelty yarn that just looks like an ugly couch! It was a super productive and creative weekend! Though most of the day was spent packing and straightening up, we did get to play a fun “Project Runway” type yarngame! These games inspire creativity and might make up next year’s Yarnival (rather than an organized workshop). 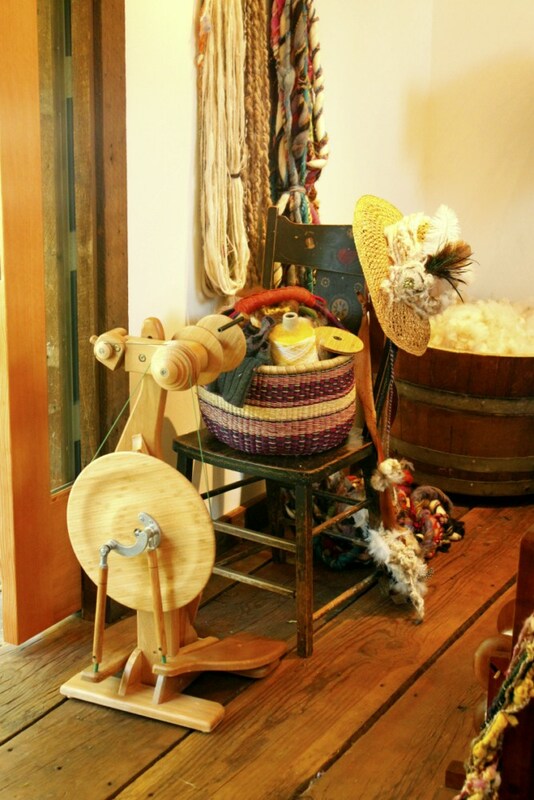 To start the game we each chose fiber/add in’s/plying yarns – everything we would need to make a yarn. Then we went down to the saloon where the spinny table is. We all put our piles onto the table and Lexi gave it a spin. Whatever pile landed in front of you is what was spun. Ashley was less than excited to get my fiber pickings- a crazy mash of color and texture. 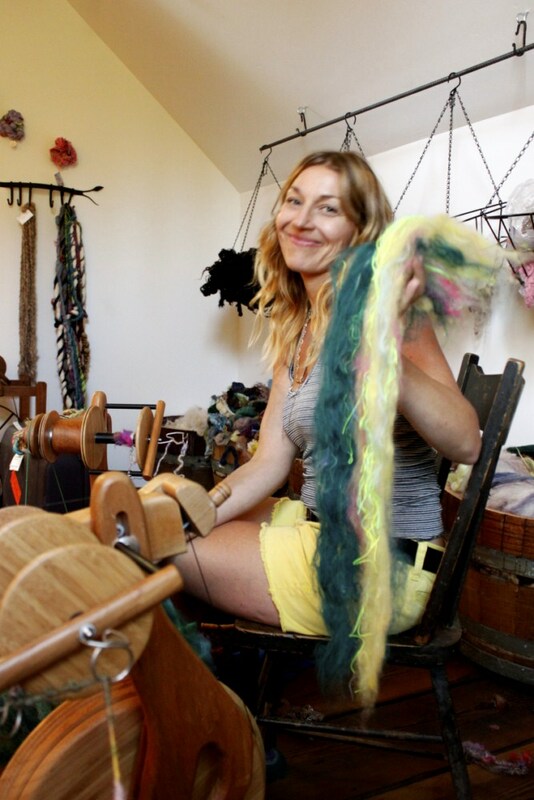 Ironically, I got Ashley’s fiber picking- which was a very “Ashley” palette of yellow’s, ivory, green and brown..
After we were done spinning our yarns we went back downstairs to the saloon. 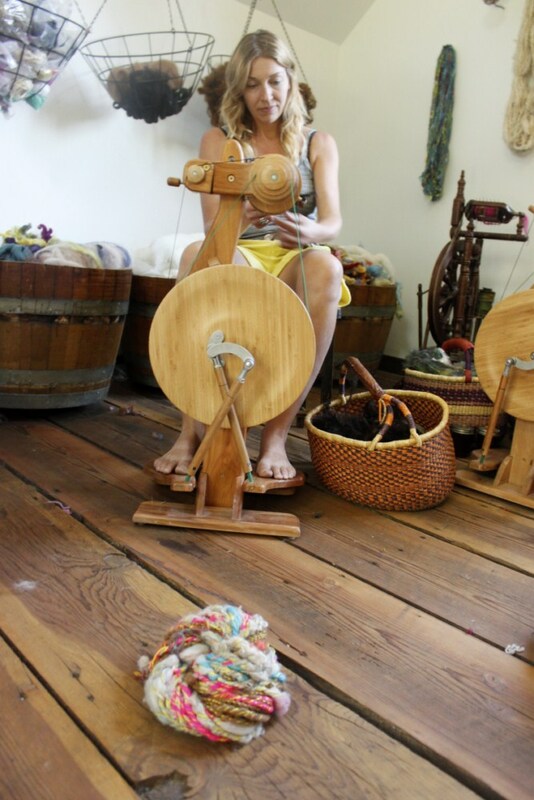 The yarns went onto the spinny table and Lexi gave it one more spin. 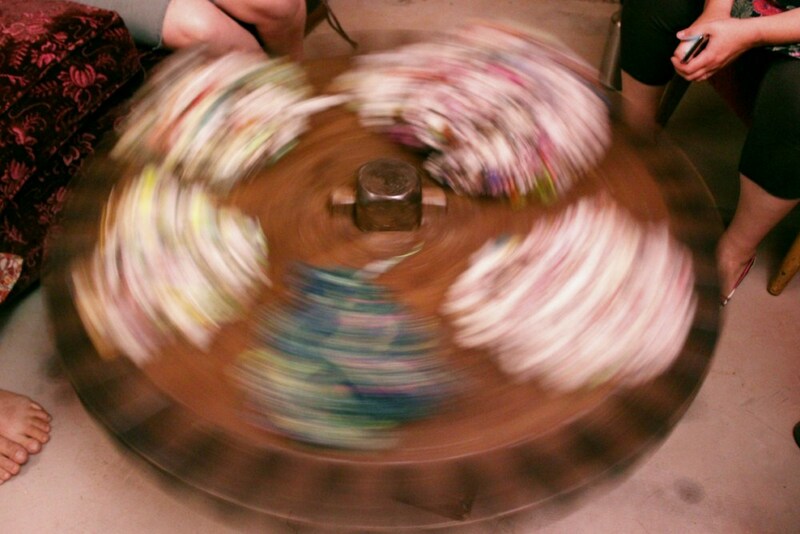 This time we were spinning to see who would go home with what yarn! 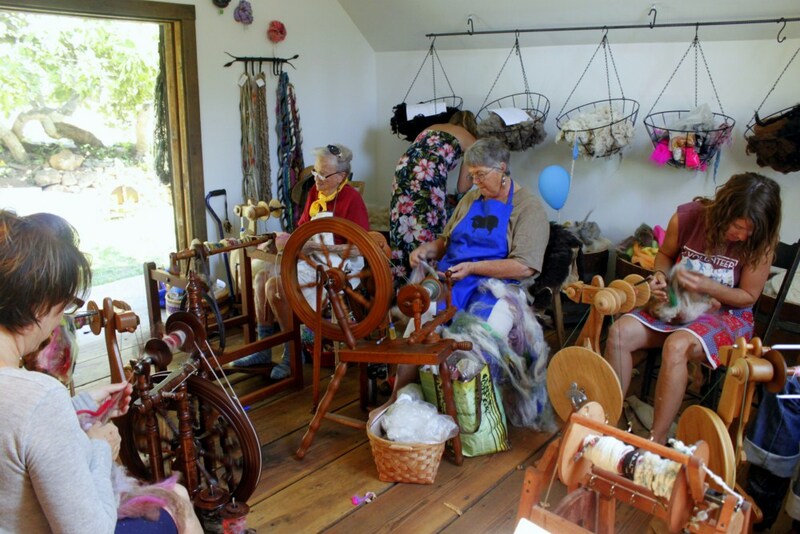 We had so much fun and we all got to take yarns that we neither picked the fiber for OR spun! 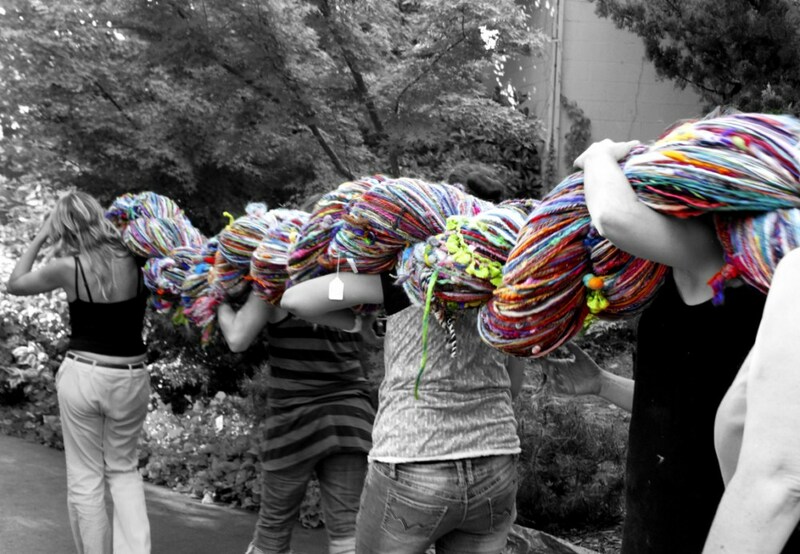 Each yarn passed through 2 hands to get to the final owner. As well as the yarn game and studio cleanup, Ashley also got her interview with Lexi and me for her documentary, and we got some last studio spinning time. It was sad to think that the next day we would all be leaving. It was so fantastic being with other spinsistas – being able to laugh about our dead periods and terrible “hangover yarns.” It’s SO good to know I’m not the only one with creative blocks and ugly yarns! Once again it was another late night in the studio as we milked the last bit of time we could spend there. Ashley took off after midnight and Heather and I went back to our tents for our last blissful night of orchard sleep. The next morning Heather and I packed up her stuff. The studio looked sad. Lexi’s wheel stood by herself, almost like she was willing everyone to come back and play. As I spent my last few moments in the studio I was really struck by how profound a place of creativity it is. 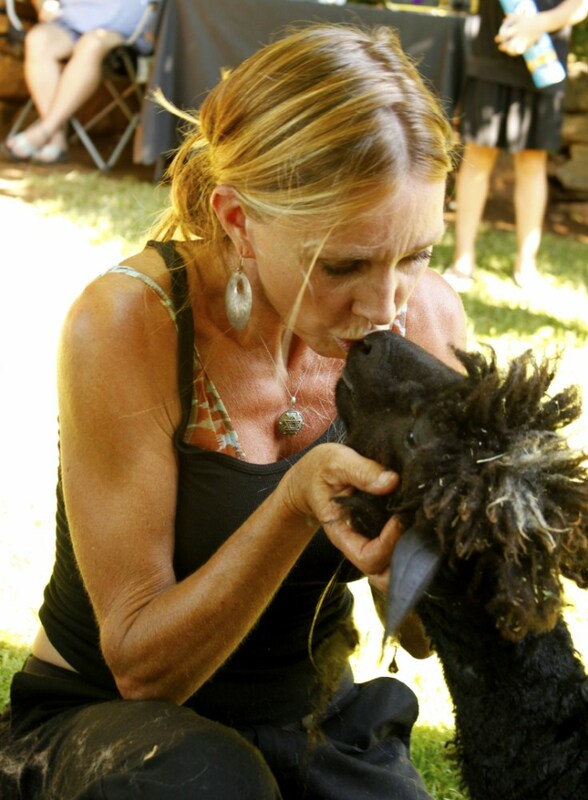 It has an amazing ability to bring people together to share ideas and techniques and to be inspired be each other and the beauty that surrounds. Some people have silent yoga retreats – this is mine. 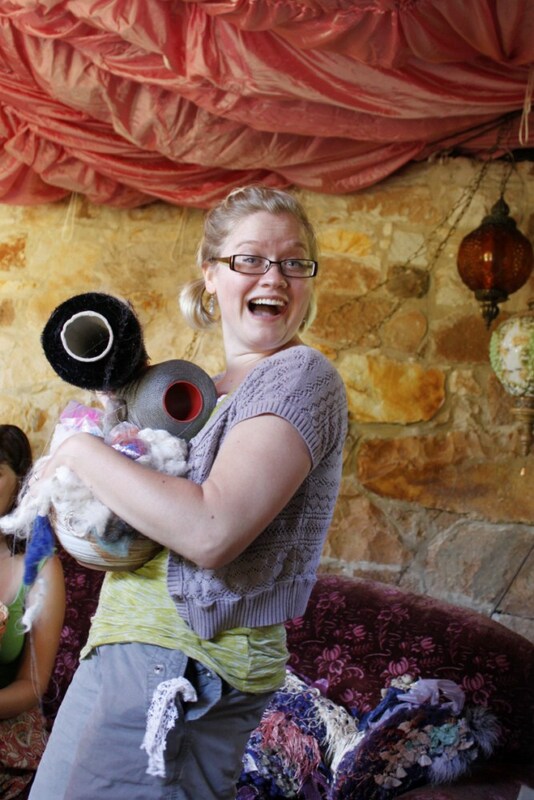 I see myself every year making a creative retreat to the Pluckyfluff Studio! Next year I’m bringing my husband so he can do “mantivites” with the other guys. There’s a brewery in town. I packed up all my stuff and brought it to the road for Byron to pick me up and bring me to the airport. I’m still not sure how I SOLD things, and yet I shipped home 2 additional boxes and my suitcase increased by 15 lbs. The flowers the Pixel had picked were just starting to fade and I knew it was time for me to get home with renewed creative energy and inspiration. See everyone next year!! To see the entire set of my photos, go to my flickr Yarnival set. If you would like to use any, or would like high res copy please msg me. Ashley made a wonderful documentary of the weekend, which includes interviews with Lexi, Pixel (Lexi’s daughter), Heather (Girl with a Hook), Carrie and Brittany (CraftyPuppyLover and Bohoknitterchic) and me. Please pay no attention to the embarrassing Go West and Thriller dancing. It was a winery and those Hangtown Coolers are a way of life. lol! My interview is at the end (1:48) It is after midnight on the last night so I’m a bit exhausted but kind of silly. I have to end this with a couple huge shout outs. 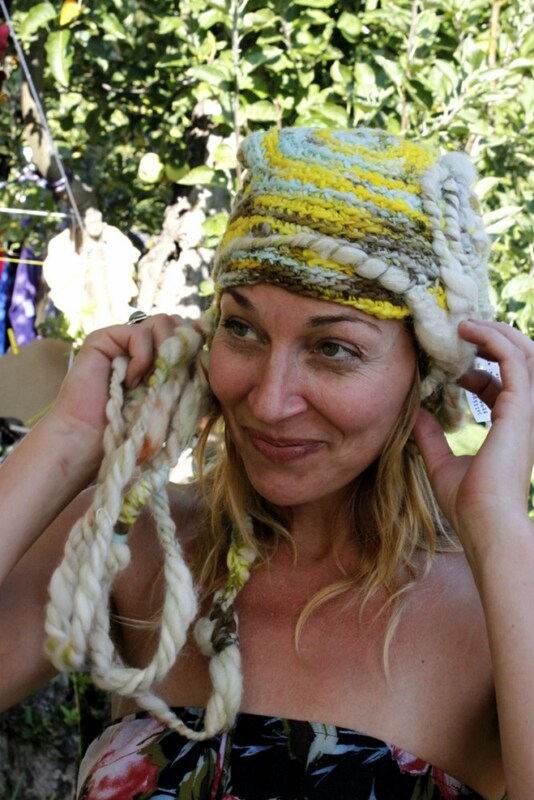 First to Lexi for being an inspiration to fiber artists, and having the ingenuity to create such a profound place. Thanks to Sue and Greg Boeger (Lexi’s Parents) for giving her the space to create, and allowing us to come and use it. Thanks to Jenny, Alex and Byron for all the work you did helping Lexi put this event on (and for generally being awesome- hoodlehoot!). Thanks to Arlene who asked me to be the voice of the Giant Skein and for always having a special word of support. I ❤ you! Thanks to my SpinSistas, Heather Lightbody and Ashley Martineau, with whom I spent the most time with over the week, and were the last standing in the studio with me. You ladies are extra special. Lastly a big thanks to my husband, who didn’t mind me running off to play in the orchard for a week, and then for spending an entire day editing the photos I came home with. I love you! Next year you’re coming too! This sounds so amazing and fantastic!!! What an awesome read!!! Thank you Esther. I’m trying to make plans now to attend next year’s event. WOW… Thanks for sharing! for those of us who will probably never get to go ..you have made me feel a part anyway! Just knowing that you girls get to be together and be creative is the most awesome thing ever.. I really have to try to get there next year. will it be an annual event? I watch the video and I was in heaven. awesome job to all of you and the work that you done on the the video.. I was very happy to seek out this net-site.I wanted to thanks in your time for this excellent learn!! I definitely having fun with each little bit of it and I have you bookmarked to take a look at new stuff you blog post. Wow!!! That was wonderful! Thanks for sharing and letting me be there vicariously. I’m soooooo jealous. Thanks for everyone’s kind words. It was an incredible week- I enjoyed writing the article! I can’t wait until next year for sure! Yes, Charisse, Lexi does plan to have it annually, except next time without the formal workshops- we are thinking about playing more Yarn Games next time.. Communal Creativity! wonderful account of Lexis big event, thanks for sharing your week! Haven’t watched the video yet. fantastic 🙂 thanks for sharing it all – color me inspired!